They are an above average number of orders placed at the bid/ask price in order to influence the market in a certain direction without the intention of being hit/filled. These orders are often refreshed in order to keep them at the back of the queue so that the person asking/bidding the large size isn't hit. The following is a Time and Sales printout from 26 August 2004 at 10:07 EST. I'll tell you what was happening below. 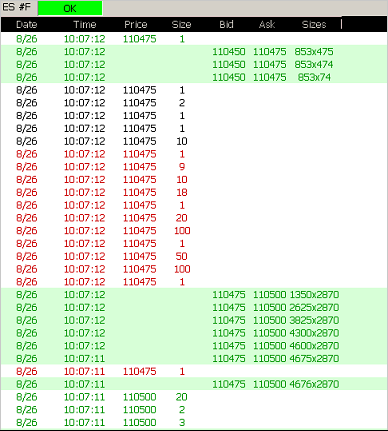 After a 1 minute 2 second pause we have 3,325 contracts being pulled from bid side. Between the time when we see the first increase in the bid size of 400 contracts to just before the 3,325 contracts were pulled from the bid size, a total of 1,478 contracts were sold at 1104.75. i.e. the bid side was hit with a sale of around 1,500 contracts during this period. So what happened? Unless Mr Big emails us and tells us, we won't know for sure. There is no reason or incentive for him to do so, in fact just the opposite, he would want to keep his modus operandi a secret so that he can use his methods in the future to take advantage of the market. Mr Big was already long and was trying to scare the market up. Mr Big was short and was bidding to get out of his short position. Mr Big was flat and wanted to get long. 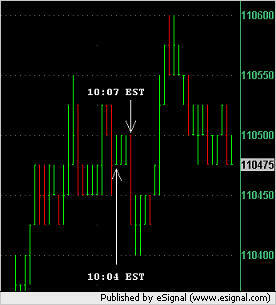 Mr Big was flat and wanted to hold the market up while he got short. I think that the most likely answer is that Mr Big was trying to scare/manipulate the market with this number of orders. The reason that I think this is because the market was trading very thinly on this day (in fact the total range for the day was 4.75 points and the biggest volume we saw in any 1 minute timeframe was around 2,500 contracts) and he was using his size to manipulate a thinly traded market in his direction. He had no intention of getting long 4,800 contracts but was instead trying to scare the market up because he was already long and wanted to get out of his position. I also feel that (in this particular case) his tactic didn't work as 1,500 contracts traded against him and he eventually pulled the rest of his bids lest he end up with a bigger long size than he wanted or his account could risk.